This chart isn’t literally keeping me up at night but of the many unknowns in both starting a new job and moving to a new area it’s what scares me the most. It compares the average monthly high and low temperatures throughout the year, the highs and lows for Portland in blue, Phoenix in red and orange. I can’t wrap my head around how the lows in Phoenix match the highs in Portland. I think I’ll love the winter in Arizona. I think I’ll hibernate in the summer. We’ll have air conditioning, and the house we hope to rent has a lovely pool (as does our backup option). I love to swim but have rarely had the chance for decades so that I am very much looking forward to. And that’s not all, as there will be lizards. Oh yes, there will be lizards. I can think of only one lizard I saw in 21 years of hiking in the wet side of the Northwest. I saw them in the dry side to the east, and perhaps I’m forgetting some I saw on my side of the Cascades, but if so they were the exceptions that prove the rule: reptiles are few and far between near Portland. We met this eastern fence lizard (I think) on the Little Arsenic Trail in the high desert of New Mexico, looking forward to seeing lizards in the Sonoran Desert where we will live. Reptiles and heat, one of them I’m going to love, hopefully I can at least tolerate the other. 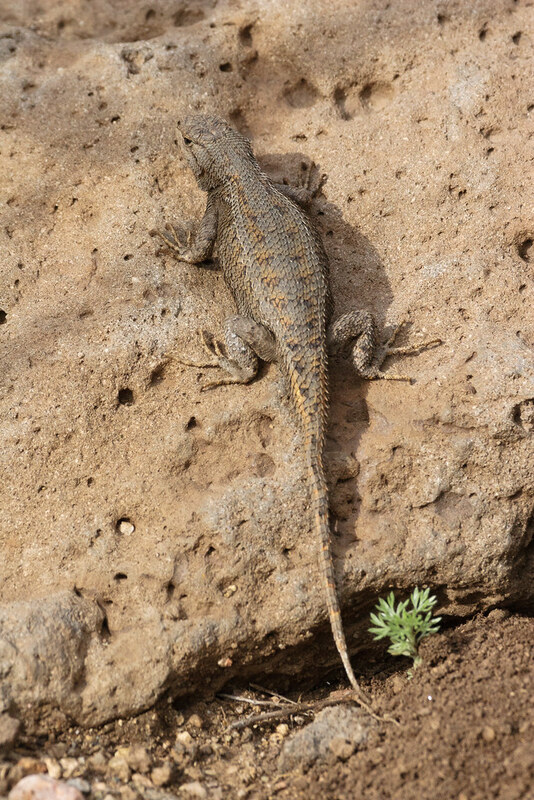 This entry was posted in General, Reptiles and tagged eastern fence lizard, Little Arsenic Trail, New Mexico, Questa, reptile, Rio Grande del Norte National Monument. Bookmark the permalink. ← And Who Might You Be?